The Spanish word uvas means grapes. When I think of grapes many memories come to mind. My mother’s family were migrant workers; her father a foreman. They followed the crops from Pomona, California to Fresno and all the little towns in between in the great California Central Valley. Picking fruit, nuts, and citrus in 90-degree weather was the norm for Mom, her brothers, and sisters. They spent a childhood in migrant camps, traveling from town to town in a loaded down jalopy like the Joad family in the book, Grapes of Wrath. One of her first memories is playing under a sunshade of green grape vines where the earth felt cool. At four years old, she cared for her baby sister as their mother worked up and down the vineyard rows clipping clusters of grapes. When I think of uvas, I remember Cesar Chavez’ boycott which began in 1965. Although Mom no longer worked in the vineyards she honored the boycott and made sure everyone in the family did so too. In 1970 the United Farm Workers union won their first contract and we could eat grapes again, but that was shortlived. Growers broke the union contracts three years later and signed sweetheart deals with the Teamsters Union. In 1973, the family boycotted grapes again. I remember the bumper stickers, NO UVAS, and the boycott against Gallo Vineyards. That boycott of grapes lasted until 1977. I was in college by then; carrying No Uvas, No Grapes signs in front of Safeway stores in Santa Barbara and my hometown of Oxnard. This tiny fruit, the uva, carries a huge weight of memories. When I drove my car over the railroad tracks, my friend, Dani, said she had never been to La Colonia, the working class neighborhood of my birth and youth. I felt my memories stir. We drove pass decorated bakeries, ‘hole-in-the-wall’ restaurants, liquor stores, and the very old, concrete church. A blend of sweet and spicy aromas entered my car. La Colonia, which literally means, “The Colony” or neighborhood, had and still has a negative connotation by many because of the crime-much of it perpetuated and unevenly reported by the media. Police cars blocked off a few of the streets, so I went down the well traveled pot-holed alleyways to find parking. We left my mom off so she could join the people on the fire truck. In her eighties now, she didn’t have to walk the 4.5 miles to mid-town. 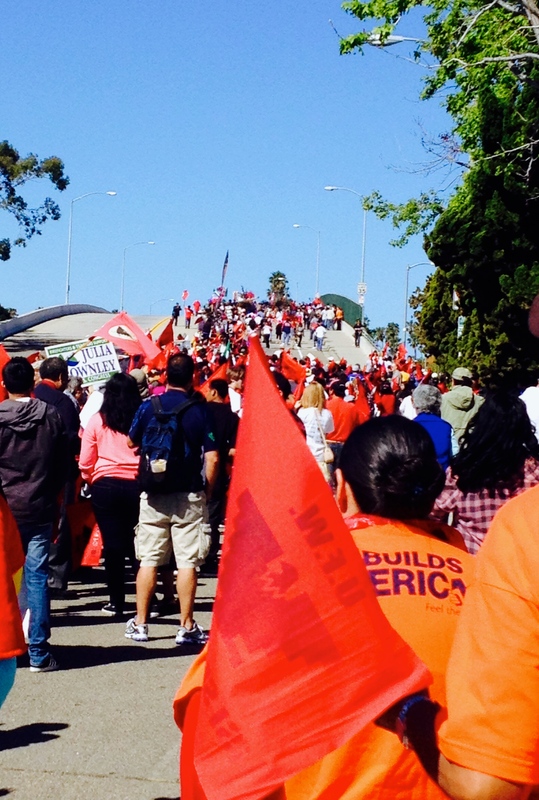 Dani and I walked a few streets to join the well organized crowd of 1,000 people for the commemorative march for Cesar Chavez day. (A holiday in only 11 states). I smiled to see so many people on an early Sunday morning. Around me were monitors for crowd control. While Dani and I waited for the march to begin I stepped outside the double yellow street line to snap a photo. One of the monitors waved at me to get back in line-just doing her job and a good one at that. The signal was given to begin. 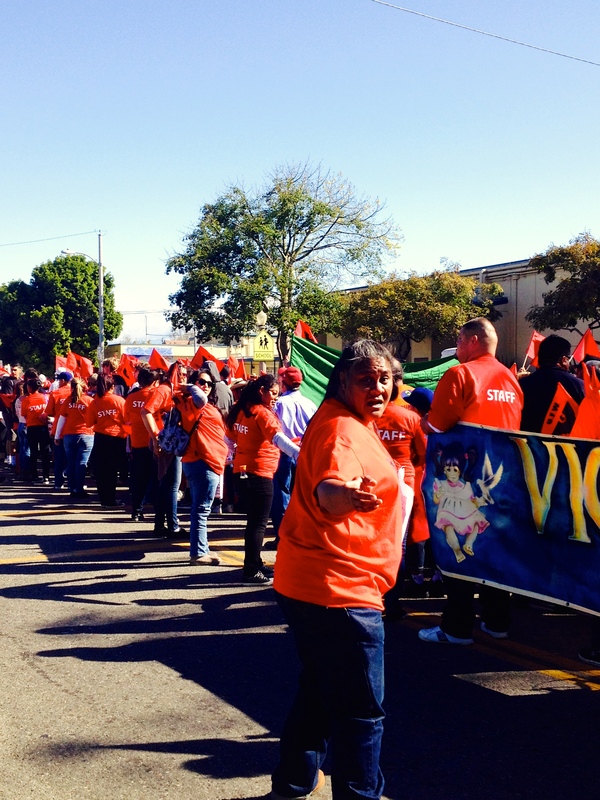 Women with strollers, a Brownie and Daisy troop, a Congresswoman, and people of all ages holding UFW flags or wearing T-shirts depicting Cesar Chavez or Dolores Huerta began to move forward. While we walked, I pointed out the housing project. “It looks so modern now, like condo’s, not at all how they looked when I lived there,” I said. Back in the 60’s/70’s the ‘projects,’ were flat topped, square looking buildings painted army green and dingy yellowed cream. The roofs and overhang section had hundreds of rocks, which were used for many a rock fight. I noticed that the old telephone poles still abounded, their low hanging electrical lines a hazard. At the corner, the church where I had my eight grade graduation and my first marriage, stood with a big banner across it, “Mariachi Mass for Mother’s Day.” Behind that church was the Catholic grammar school, where my sisters, brother, and cousins attended first to eighth grade. “Hey, wait, are some of these places in your story?” Dani had read one of my manuscripts. “Yep, my neighborhood is the setting,” I said with some nostalgia. Soon we passed small houses, many filled with flowers and fruit trees, squeezed into miniscule front yards. Several women and children leaned on their fences and watched us walk by, a moving wave of red flags, banners, and colorful tee-shirts. An elderly man in a walker stood on his porch. With one hand, he gripped his walker, in the other he held up his red with black eagle flag. The red line moved forward as a slow wave of water. 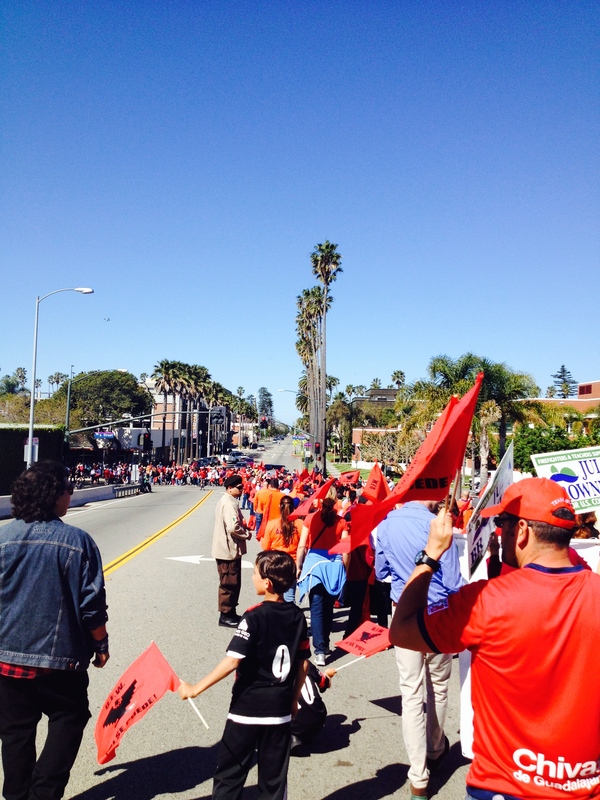 Chants of “Si Se Puede,” “Viva Cesar,” and “Justice,” rang out around us. I felt my heart stir. The march slowed to a stop as we made the turn to the bridge. “I remember when we didn’t have a bridge,” I said. “We took the city bus to school. If the train was stuck on the tracks, which happened half the time, their was no way out of Colonia. Over the bridge we flowed, 1,000 of us, to the plaza park area. My march down memory lane was over but it’s never forgotten. After the march ended and the Aztec Dancers finished with a ceremonial dance, we entered the movie theater to watch a movie on Cesar Chavez. The film was very well done, with historical facts blended with personal, family dynamics. I have to say that Michael Peña and America Ferrera did a much better job than I thought they would, based on their other movies. I wished Rosario Dawson, as Dolores Huerta, was given a meatier role as Dolores Huerta deserved. This movie is one that everyone should see to further their knowledge of social justice, non-violent activism, and history. Happy Birthday, Cesar, and may future generations come to recognize your non-violent work for social justice, worker’s rights and equality. 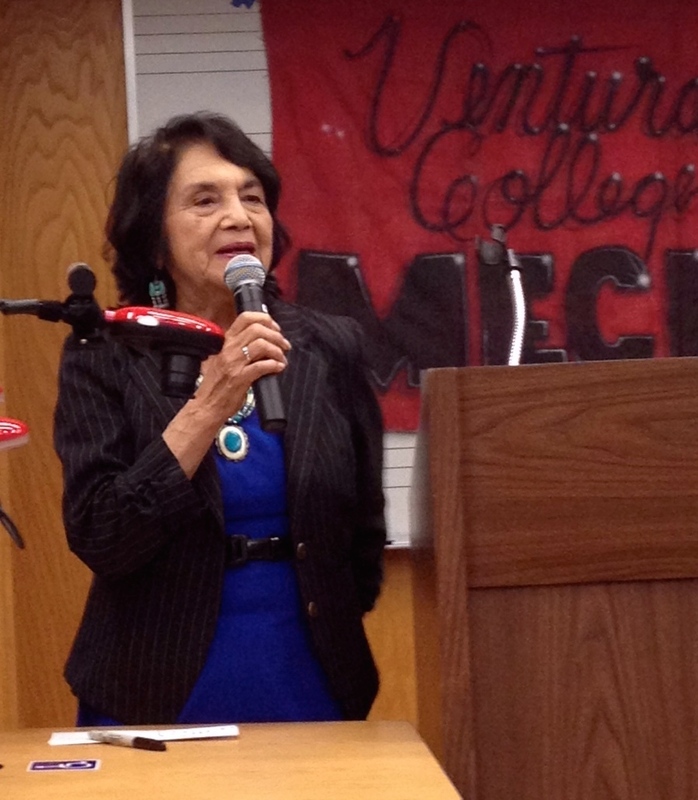 The newspaper said that Dolores Huerta, civil rights activist and co-founder of the United Farm Workers (UFW) was to speak at a local community college. 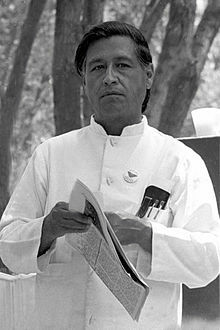 Now, I was a little surprised since my mother marched four times with Cesar Chavez with the fifth time being his funeral procession to his resting place in Keene, CA. That evening we arrived early so we could sit up front. The college students, who sponsored the presentation, made Champurrado, Arroz con Leche, enchiladas, rice, and a whole array of foods. One thing about Latinos, we do like to eat and we put out food for guests. At the appointed time of the presentation there were no seats left with at least fifty people standing. 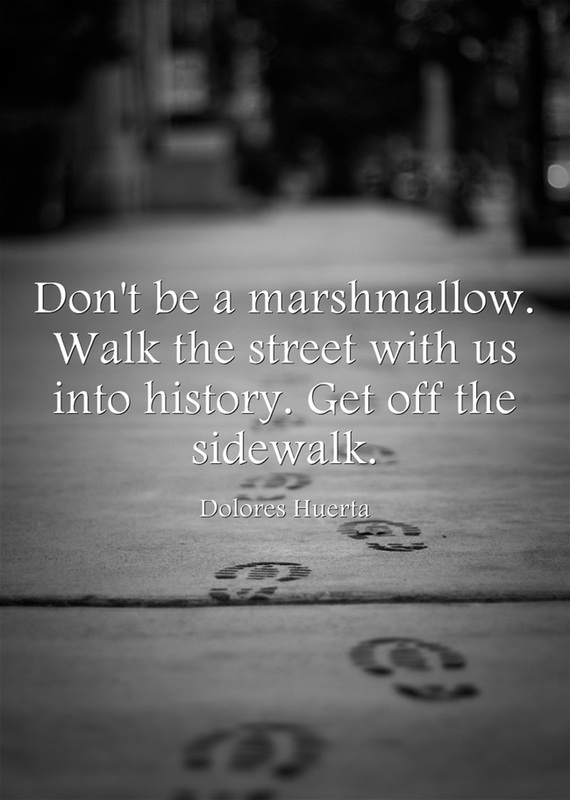 Dolores Huerta, a petite woman with a strong voice, took the stand. She spoke about the hardship of the early days (1940-60’s) of farm labor work. No bathroom facilities, one water jug with one shared cup for everyone, the short handled hoe, no rest periods, and pesticide spraying over farmworkers in the fields. My mom made the migrant circuit to pick crops with her parents. She nodded her head at this information. I couldn’t tolerate seeing kids come to class hungry and needing shoes. I thought I could do more by organizing farm workers than by trying to teach their hungry children. She co-founded the National Farmworkers (later the UFW) in 1962. This was made possible by collaborating with other workers, mainly Filipinos, who were ‘imported’ to work the fields. She was not only an organizer, but a contract negotiator. Who has the power? We have the power. People power. Non-violent protest is difficult. Organizing workers was tough especially with backlash from growers and police. Huerta was severely beaten, resulting in broken ribs and ruptured spleen, by San Francisco P.D with batons during a non-violent march. Later she won her court case. Dolores and Cesar spoke with Latino leaders in Arizona (his native state)when the legislature pushed through an agribusiness sponsored bill denying farm workers the right to strike and boycott. Latino leaders declared this bill couldn’t be beaten. Cesar and Dolores silently listened while they explained why the fast and efforts by farm workers would be fruitless. “Si, si se puede!” (“Yes, yes, it can be done”). Dolores Huerta coined that phrase. Dolores Huerta is an intelligent, tenacious woman who has dedicated her life to her passion for social justice and equality for all people. She teaches us that we have to get out there for the things we believe in and value. It’s not easy to make that trip, but it is worthwhile. Ms. Huerta is 83 years old and still advocating for farmworker rights, women’s rights, and heads an education and leadership foundation. 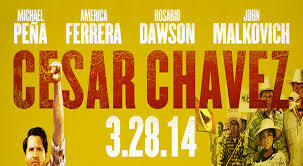 Now, when you go see the movie about Cesar Chavez, UFW, and non violent organization (I really hope you do attend a showing) remember that this is a true story, part of history, and Dolores Huerta carries on this work.